Oh my, the feeling of anxiety getting started with bees can be overwhelming. You feel you do not know enough. You've read and studied, but can you really install that package? Consider taking my ONLINE BEGINNERS BEEKEEPING COURSE. As a Certified Master Beekeeper, I'll help calm your fears with solid information and training. Installing a package of bees is confusing at times. The fact that you are reading this page may indicate that you are somewhat rusty or unsure of installing a package of bees. That's to be expected. I'm glad you came here and now, let me help calm your fears. First, I have to be brutally honest and let you know that beekeeping is hard. It's a fun and enjoyable hobby, but it's very challenging keeping bees alive. You've invested a considerable amount of time and money. You have spent over $100 for bees, several hundred for a hive and more in your equipment and protective gear. Please consider investing another $59 for my online course. 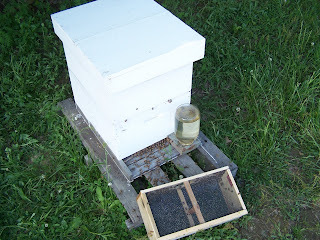 In my ONLINE Basic Beekeeping Course, I'll walk you through installing bees and getting started. I know you've watched some YouTube videos and maybe read a book or two. But there are so many opinions. Do you really trust the fellow at the bee club? Warning! Without the basic fundamentals under your belt, you are much more likely to lose your bees the first year. Statistics show that approx. 70-80% of first timers are out of beekeeping after their first year. I think it is because of their lack of knowledge. Why not let me coach you through your adventures in beekeeping. We still have spots available in our mentorship program as well. Click here for more information. First, you must purchase your beekeeping equipment. Do not wait until spring to purchase your hive kits. Many places are sold out or back logged in the spring so you must order your hives between now and May. This year you can order a hive and a package now. Click here for more info. A common type and amount of honey bees to order is a 3 pound package with an Italian queen and she is mated. Bees come in a box is equipped with a sugar water dispenser and a cage to keep the queen separate from the bees. To prepare for the arrival of your bees, or if you are picking them up here, you will want to purchase a new spray bottle and mix sugar water, one part water to one part sugar. Do not use old spray bottles that have been used with other chemicals as this could make the bees sick or kill them. Have your new spray bottle ready when your bees arrive. Try to keep the package in a shaded or dark place in the car or truck. If you use a truck, try to avoid excessive wind damage that may occur if you place your bees in the bed of your truck. If you have to travel a long distance at interstate speed, and the bees are in the bed of your truck, place something around them, protecting them from the wind, while also providing sufficient air flow. Bees must have air to breathe just like us! Sometimes, the weather might be too wet or cold to install your bees the same day they arrive. In this case visit my "How To Install A Package In Bad Weather" page. Will the bees in the package sting you? Honeybees can always sting. However, you will find that by spraying them with sugar water, they are very calm. And, since they do not have any brood or honey to protect, they are not trying to defend their hive. Technically they don't have a queen either. Their morale is low, so they are not aggressive at all. When I install packages, I do not wear gloves or hat and veil. I would not recommend it to you, because you don't want a bad experience on your first installation, but you will find the bees to be very gentle. Work with confidence! This lesson continues but please watch my video on how to install a package. Also, before you install your package, you'll want to use our Burns Bees Feeding System on the top of your new hive when feeding in the spring. Our system allows you to change your sugar jars while keeping the bees below the screen. You can also add a little dose of protein powder to your 1:1 sugar water to help your bees obtain the spring protein they need. Click here to order now. Now, spray the package thoroughly on both sides of the screen, front and back. This will calm the bees, keep them well-nourished and keep them from flying about so much during the installation process. Be prepared for sticky hands and fingers. The bees may become noisy which is normal. Spray them again if you need to calm them. They are becoming loud not because you are making them mad, but simply because of the sunlight and air. They are ready to do what bees do. Make a hive and gather nectar. Stay calm and confident! You will need to pull out the queen cage now, prior to shaking the bees or else it will fall into the hive. If it does, no problem. The queen is okay, just remove the cage and place it on top of the hive off to the side from where you'll be pouring your bees. Now begin shaking your bees out of the package and into the new hive. Shake as hard as you want and you'll start seeing them pour into the new hive. You may also want to firmly strike the side of the package with the palm of your hand to free bees that are hanging on to the screen. However, be sure not to strike a bee when striking the side of the box or you might smash a bee just enough to get stung. Notice in the picture, I'm using an entrance feeder because this is an old photo. Entrance feeders are from the old paradigm of beekeeping. These do not work well IF and WHEN on cold spring days when temps dip below 50 and bees cluster. They will not break cluster to feed. Instead, we suggest my Burns Bees Feeding System that will feed your spring packages even on cold days! Click here to order yours today. Once you've removed the cork, (or cap on plastic queen cages) you will want to place the cage between the frames in the center of the hives from the top. Notice how I use the pressure of the hive frames to hold the cage between the frames. I hang my queen cage with the candy side down. Some say to hang it with the candy up, incase her attendant bees within her cage die, they do not block her exit. However, bees are good about moving dead bees out of the way, and I want her to exit out onto the foundation.